The chapter examines and discusses the approach taken by a regional government to implement e-government as a means of providing e-services, thus enhancing accountability and performance management Specifically, the purpose of this chapter is to acquire a fundamental understanding of how e-services are adopted within regional governments in Spain and to determine precisely which factors have most impact on their adoption. Furthermore, we identify critical success factors (CSF) for innovation and the adoption of e-services in Andalusia, the most populated region of Spain. Our analysis of this case study identifies nine CSFs in the adoption of e-services in Andalusia. 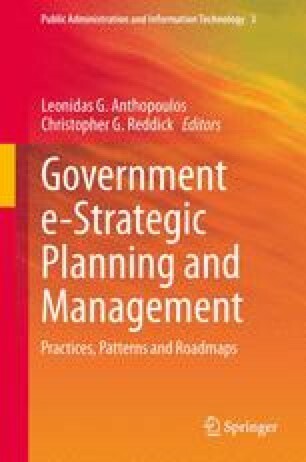 The research reported in this chapter has been supported by the Andalusia Regional Government thought the excellence project “Improving the management, transparency and participation in Local Governments thought the Web 1.0 and Web 2.0” (P10-SEJ-06628). Andalucia compromiso digital (2013). Abierta la convocatoria de cursos gratuitos de teleformación en internet, nuevas tecnologías y Sociedad de la Información Retrieved from https://www.andaluciacompromisodigital.org/node/352461. Angelopoulos, S., Papadopoulos, T., & Kitsios, F. (2009). Services innovation in e-government: a road map for a critical success factor approach. European and Mediterranean Conference on Information Systems 2009. Retrieved from http://www.iseing.org/emcis/cdrom%20proceedings%20refereed%20papers/proceedings/presenting%20papers/c47/c47.pdf. Araya, R., & Porrúa, M. (2004). América Latina Puntogob. Casos y tendencias en gobierno electrónico. Chile: Coedición FLACSO – AICD OEA. Retrieved from http://www.gobiernofacil.go.cr/e-gob/gobiernodigital/informes/AmericaLatinapuntogob.pdf. Capgemini Consulting. (2012). Estudio Comparativo 2011 de los Servicios Públicos online en las Comunidades Autónomas Resultados. Retrieved from http://www.proyectosfundacionorange.es/docs/Estudio_Comparativo_2012_Servicios_on_line.pdf. G-7 (1997). Government Strategies and the New Information Technologies. Retrieved from http://www.open.gov.uk/govonline/golintro.htm..
ICT PSP Management Committee. (2011). Competitiveness and Innovation framework programme ICT policy support programme. Retrieved from http://ec.europa.eu/information_society/activities/ict_psp/documents/draft_ict_psp_wp2011_approved_by_cip_ictc_on_17122010.pdf. United Nations. (2013). E-government development database. Retrieved from http://unpan3.un.org/egovkb/datacenter/countryview.aspx. World Bank (2013). Definition of E-Government. Retrieved from http://www.worldbank.org/.